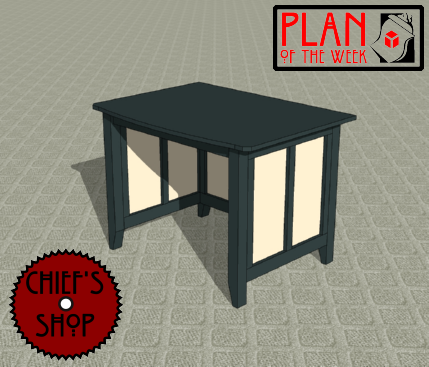 The Chief’s Shop Home Office Desk is a slightly undersized desk designed for laptop work. In addition to a computer, a printer/scanner, lamp, fan, and a few small items could fit on top. It requires some 1x2s, 1x3s, and 3/4-inch plywood. Overall dimensions: 41 1/2 inches wide x 30 3/4 inches deep x 29 3/4 inches high. You’ll need a table saw or circular saw, miter saw, drill driver, and Kreg Jig to build it.